Last week, the Hurds decided to get more aggressive with our exercise plan. I typically use our Xbox Kinect to do this, but nothing replaces the beauty of the great outdoors. My husband Aaron pulled his old mountain bike out of storage. I didn’t own a bike so we visited a friend’s bike shop and purchased one. The reason I didn’t already own a bike is because I honestly don’t like them. 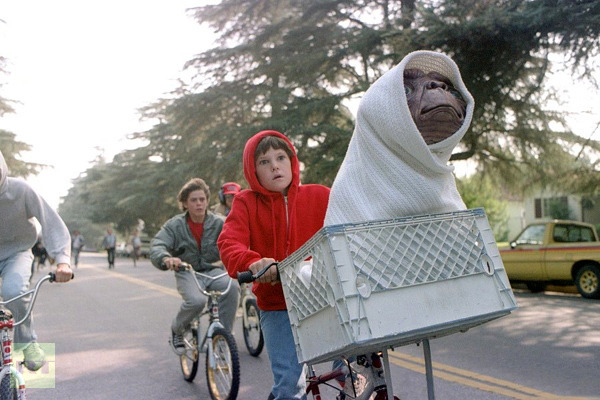 My aversion for bikes stems from a “traumatic” event in my childhood (*cue sad organ music*). When I was nine or ten, I went cycling with a neighborhood friend Tammy one afternoon. Tammy and I were riding on a neglected road behind my house, as was our habit. There is an old childhood game called “Chicken” that we occasionally played. Tammy descended a hill, while I pedalled toward her. Usually, at the very last second, one of us would turn the bike out of the path of the other. Now, as an adult, I don’t see why we didn’t compose some sort of contingency plan. For example, what if we both decided to turn the same way? Or what if neither of us decided to turn? But kids don’t consider those sort of questions. Kids just love to feel the wind against their face, the ecstasy of motion, the intoxication of freedom. Plus kids know that Mom will fix them right up if something goes askew. This particular day, the latter occurred. Tammy and I went barreling toward each other. Each of us expected the other to turn, but neither of us did. We both ended up having a colossal accident (well, you can’t really consider it an “accident” because it was quite intentional), rolling in the road and laughing to mask our real pain (or maybe that was just me who did that…). However, this event was the root of a fear that I nurtured unchecked for years – the fear of falling. I am not referring to falling down a flight of stairs necessarily (which is equally embarrassing), but falling while in motion. Sure, I had seen it a thousand times on Looney Tunes, but there was no ACME to fix me in the real world. In the real world, haphazard choices can have long-term consequences. Not long after that incident, I stopped riding bicycles. Here I am nearly 25 years later gripping the handlebars with white knuckles. From somewhere deep inside me, the fear was rekindled. The day we bought my bike, I was cautiously test riding while groups of young children flew by me riding and giggling, smiles on their faces. Ah, showoffs! Of course, they had to ride by while some strange lady couldn’t commit a turn in the parking lot of the bike shop. As a car approached, I panicked. I pulled over to the side and attempted to jump off the bike while it was still in motion. Thanks to the ole’ “tuck and roll” method I was uninjured, but the message was clear. I, once again, was too busy trying to control too much. I was over-thinking instead of just enjoying the experience. There are times in life where we feel helplessly out of control. We look for the brake but we continue to be carried on by the momentum of time. Last year, when my Mom fought (and conquered) breast cancer, I did the same thing. I wanted to pull the brake. Nearly anesthetized with fear, I had to push forward, trusting God would carry me as He promises He would. Whatever trial you face in life, brace yourself and keep pedalling. This season will pass, and just as God did with me, He will make something beautiful out of the experience. Keep pedalling and who knows, you might just enjoy the scenery you ignored while distracted by your fear. As for me and my bike, I’m still struggling. With every passing day, I slightly improve. I’ll keep you posted. I really liked this story/message of inspiration! Thanks for sharing it!